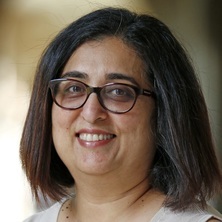 Aparna Hebbani (2009). Putting my best foot forward. In Joann Keyton and Pamela Shockley-Zalabak (Ed. ), Case studies for organizational communication 3 ed. (pp. 293-299) New York, U.S.: Oxford University Press. Hendrix, K. G., Hebbani, A. G. and Johnson, O. (2007). The “Other” TA: An exploratory investigation of graduate teaching assistants of color (GTACs). In Brenda J. Allen, Lisa A. Flores and Mark P. Orbe (Ed. ), Intercultural and international communication annual: Communicating within/across organizations (pp. 51-82) Washington, D.C., U.S.A.: National Communication Association. Webb, L., Walker, K., Bollis, T. and Hebbani, A. (2004). Perceived parental communication, gender, and young adults' self-esteem: Male, female, and universal path models. In Philip M. Backlund and Mary Rose Williams (Ed. ), Readings in gender communication (pp. 197-224) Belmont, CA, U.S.A.: Wadsworth. Hebbani, Aparna (2017) Preface. Media Watch, 8 2 - Special Issue: . Hebbani, Aparna (2017) Preface. Media Watch, 8 1 - Special Issue: . Hebbani, Aparna and Angus, Daniel (2016) 'Charity begins at home': public perceptions of the homestay initiative for asylum seekers in Australia. Australian Journalism Review, 38 1: 83-100. Hebbani, Aparna and Preece, Megan (2015) Spoken English does matter: Findings from an exploratory study to identify predictors of employment among African refugees in Brisbane. Australasian Review of African Studies, 36 2: 110-130. Peng, Fan and Hebbani, Aparna (2014) Navigating through the Australian workplace: mapping the experience of working holiday makers (WHMs) in Brisbane. Intercultural Communication Studies, 23 2: 33-53. Francois, Aurora, Hebbani, Aparna and Rintel, Sean (2013) Facebook in the university workplace. Media International Australia, 149 149: 15-27. Hebbani, Aparna and Wills, Charise-Rose (2012) How Muslim women in Australia navigate through media (mis) representations of hijab/burqa. Australian Journal of Communication, 39 1: 87-100. Back to the future: Is strategic management (re)emerging as public relations' dominant paradigm? McDonald, Lynette M. and Hebbani, Aparna G. (2011) Back to the future: Is strategic management (re)emerging as public relations' dominant paradigm?. PRism, 8 1: 1-16. Hebbani, A. and Frey, L. R. (2007) The intercultural hiring interview: Applying uncertainty reduction theory to the study of nonverbal behavior between U.S. interviewers and Indian applicants. Intercultural Communication Studies, 26 3: 36-52. Hendrix, K. G., Hebbani, A. and Johnson, O. (2007) The "other" TA: An exploratory investigation of graduate teaching assistants of color (GTACs). International and Intercultural Communication, 30 2007: 51-82. Hebbani, A. (2007) You can't "de-race" and "de-womanize" me: Experiences when you go global. New Directions in Teaching and Learning, 110 Summer: 45-54. Hebbani, Aparna and Hendrix, Katherine Grace (2012). International teaching assistants in the U.S. American classroom. In: National Communication Association 98th Annual Convention, Orlando, United States, (). 15-18 November 2012. Hebbani, Aparna and McNamara, Jayson (2010). Examining the impact of "visible differences" on multiple marginalization of Somali and Sudanese former refugees in Australia. In: Kerry McCallum, 2010 Conference of the Australia and New Zealand Communication Association (ANZCA 10), Canberra, Australia, (). 7-9 July 2010. Van Vuuren, Kitty and Hebbani, Aparna (2010). Investigating the role of Australian media in making Sudanese refugees feel 'at home': A case of advocating online media support to enable refugee settlement. In: Anna Hayes and Robert Mason, Refereed proceedings of the national symposium titled Migrant Security 2010: Citizenship and social inclusion in a transnational era. Migrant Security 2010: Citizenship and Social Inclusion in a Transnational Era, Toowoomba, Qld, Australia, (201-208). 15-16 July 2010. Hebbani, Aparna and Sally Athanassiou (2008). An exploratory study of sexual imagery in Australian magazine advertising. In: Elspeth Tilley, ANZCA08: Power and Place: Refereed Proceedings. 2008 ANZCA Conference: Power and Place, Wellington, New Zealand, (1-37). July 9-11, 2008. Hebbani, Aparna (2008). Managing cross-cultural encounters: Presenting a rationale for studying Australian-Indian business communication. In: Elspeth Tilley, ANZCA08: Power and Place: Refereed Proceedings. 2008 ANZCA Conference: Power and Place, Wellington, New Zealand, (1-16). July 9-11, 2008. Hebbani, Aparna Girish (2004). The intercultural hiring interview: Studying nonverbal behavior. In: Nakiye Boyacigiller and Tunga Kiyak, Proceedings of the 46th Annual Meeting of the Academy of International Business. Academy of International Business 2004 Annual Conference, Stockholm, Sweden, (187-187). 10-13 July 2004.